In December 2017 Lambeth County Court closed its doors forever. It was one of the 86 courts and tribunals across England and Wales – 10 in London alone – that the Ministry of Justice is shutting as part of the Government’s programme of cutbacks. 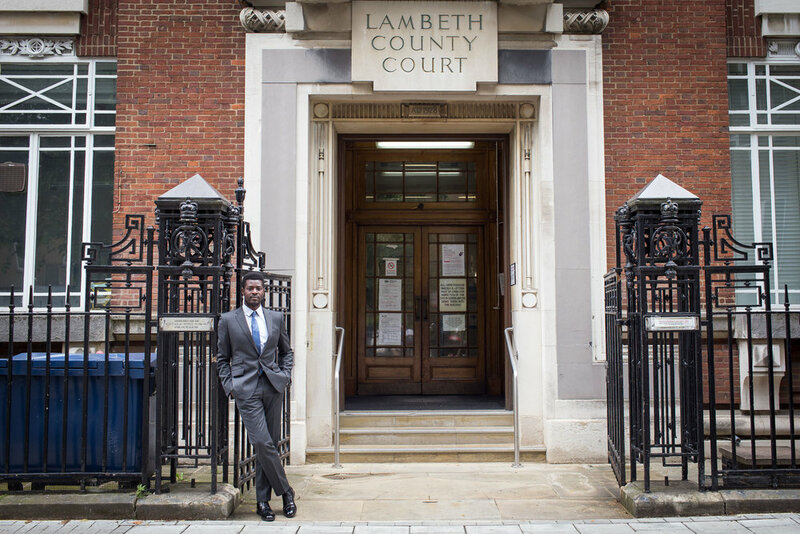 I wanted to understand what Lambeth was losing, so before it closed I spent time shadowing the duty adviser to see the court in action and meet some of the defendants on the brink of eviction. This story was originally published on my blog, Lambeth: Living with the Cuts, in July 2016. LAMBETH COUNTY Court is the busiest housing court in England and Wales. It deals with nearly 5,000 possession claims a year – the vast majority of which are made by social housing landlords trying to evict very poor tenants. Despite this demand, the Ministry of Justice (MoJ) has concluded that it should close next autumn, and that its cases should be moved to courts in Camberwell and Putney. For many defendants it will mean longer and more expensive journeys. In researching the case to try to save the court (which the MoJ rejected earlier this year), the law centres that represent many of its poorest defendants found that journey times would increase for some from 40 minutes to an hour and 40 minutes. They believe that more tenants will simply not attend hearings as a result, which will lead to an increase in evictions and homelessness. Brixton Advice Centre (BAC) is one of a number of legal advice centres and firms of solicitors that provide duty advisers for the court, a scheme funded by Legal Aid and managed by Lambeth Law Centre. The duty adviser is there to represent defendants who come to court without legal counsel – usually because they can’t afford it and don’t realise that Legal Aid is available. The cases they deal with are all possession hearings. BAC’s Nathan Scott invited me to follow him on his monthly duty adviser shift so that I could better understand the work the court does and the circumstances that bring tenants there in the first place. When we arrive at 9.20am the waiting area is already busy. The atmosphere is tense and people are clearly nervous. Conversation is hushed. One woman is in tears, being comforted by her friend. Everyone is dressed smartly, mostly wearing black. It feels like walking into a stranger’s funeral. It’s not difficult to spot the lawyers, landlords and housing officers, for whom it’s a normal day at the office. They’re just doing their jobs, but their confident demeanour jars nonetheless, and their mobile phone conversations, conducted at perfectly normal volumes, sound loud and harsh here. A handful of tenants are already waiting to see Nathan. One after the other the court runner guides them into the small interview room where we’ve set up shop. All the defendants we meet today are social housing tenants. Nathan explains what it’s like to represent people he knows nothing about. “You’re effectively working blind,” he says. “You meet people for the first time and have around 15 minutes in which to get the details of their case before you then have to represent them in court.” Today is a relatively quiet day, so he gets up to 20 minutes with some clients. On busy days he can get as little as ten. There’s scant time for pleasantries, although Nathan tries to extract the critical information as gently as possible. He has to keep people on track when they go off on tangents, raising issues that he knows will have no bearing on today’s proceedings. One defendant breaks down in tears. Others seem to be in a state of shock. None seem to really understand what’s going on. He has to quickly survey whatever evidence they’ve brought with them – receipts for rent payments, communications about their benefits from the Department for Work and Pensions, letters from their housing officers and suchlike. “You’re sometimes almost entirely at the mercy of the paperwork that people do – or usually don’t – have with them,” he says. One tenant has a text on her mobile phone that could help, but she’s almost out of battery and can’t find a charger. He explains that there can be various outcomes. A complete withdrawal of a case by the landlord or dismissal by the court is the best-case scenario. The matter can be adjourned generally with liberty to restore, which effectively means the matter is at an end. More common than this is an adjournment on terms – where, provided the defendant does whatever the judge asks them to do, the claim for possession is adjourned. Then there’s a suspended possession. This sets conditions which give the tenant the opportunity to avoid being evicted, provided they comply with terms set by the court. If they’re breached, the landlord has the right to fix a date for possession of the property. Finally, the worst-case scenario is outright possession being granted – in other words, eviction. But even if this happens, the tenant will be given two weeks or more in which they can vacate – or appeal. Nathan’s job is to get as many cases adjourned as possible and to avoid outright possession at all costs. “I’m essentially buying them time and opportunities to comply,” he says. He’s also arming them with knowledge: explaining what’s going on procedurally, and advising what they need to do next to fight the eviction if possession is granted. We meet a single mother who was recently made redundant, has struggled to find work since and is now trying to start her own business. She’s currently earning £60 a week. She receives no benefits and has built up nearly £1,700 in rent arrears. She’s applied for housing benefit, which Nathan thinks she’ll get – but this can take months, and in the meantime the local authority is seeking possession. She has no realistic prospect of being able to find another home for herself and her son. If evicted, because the council is obliged to house anyone with children, she would most likely be moved into temporary accommodation. Another local authority tenant, aged 59, who has lived in the same property for 30 years and works full time for the NHS is here because of disrepair to her home. She tells us that the council, Southwark, has taken nine years to rectify water damage. The damp and mould had become so bad that she ended up paying for it to be fixed herself – but she was then unable to pay her rent. She was two months in arrears when Southwark issued a possession notice. She’s never been in arrears before, has nowhere to go, but, nonetheless, Lambeth Council is attempting to evict her. Perhaps most troubling of all is the young single mother who arrives with her 18-month-old daughter and case worker. She was made redundant in May from her job as a care worker, having struggled to balance work with childcare since returning from maternity leave. Only 20 years old, she didn’t know she was entitled to housing benefit and so has built up £2,500 in rent arrears while looking for work and waiting for her redundancy money to come through. She’s never been in arrears before, has nowhere to go, but, nonetheless, Lambeth Council is attempting to evict her. She is distraught. For all the stress, fear and confusion, today, it turns out, is a good day. Every defendant Nathan sees is granted an adjournment on terms. The only possession order made is for a woman who refused the offer of free legal counsel. Nathan was talking to another client in the interview room when she arrived, and instead of waiting for him she went straight into court unrepresented. The story of Lambeth County Court is, I believe, the story of austerity itself. So many of the defendants who come here have been affected by the cuts, Nathan tells me – primarily in relation to benefits. In 2013 the DWP introduced new, tougher rules that mean genuine claimants can be left in financial limbo for many months at a time – as detailed in an interview I did with Nathan for my blog, Lambeth: Living with the Cuts. Housing benefit is usually at the root, as it is in most of the cases we hear this morning. Those defendants too poor to afford a solicitor rely on Legal Aid for representation, provided by legal advice centres like BAC. Since 2012, however, Civil Legal Aid has been cut back by the Government, reducing the support available for people who can’t afford it themselves. Benefits advice, for example – something that would almost always only be needed by people too poor to afford a solicitor – is now entirely outside of its scope. Many people don’t realise, however, that support does still exist for those fighting eviction. What’s more, the closure of courts around the country, and the increased travel costs associated with this, will put further strain on what remains of the Legal Aid budget. So now many advice centres, which provide a lifeline for their clients but are a thorn in the side of the Government, are at risk of closure or cutbacks – victims of austerity themselves. Even the landlords have been hit. Lambeth and Southwark councils have seen massive cuts to their budgets from central Government (56% in the case of Lambeth), and both suffer from a chronic shortage of social housing (there are currently 23,000 people on the waiting list in Lambeth alone). This shortage of housing is contributing to the volume of possession hearings – councils need as many properties back as they can get. And now the court itself is a victim. Austerity, it seems, is attacking in every direction. But in each case the ultimate victims are always the same – the defendants, the tenants, the benefits claimants. The poor and powerless, to put it more bluntly. When Lambeth County Court hears its last claim next year, some of the most vulnerable people in Lambeth and Southwark will see access to justice stretch further from their grasp. In isolation, it may not seem like much – especially to those unlikely to find themselves fighting a possession claim, or for whom a £1.50 bus fare is not a decision that needs to be carefully weighed up. When looked at in the broader context of austerity, however, it seems increasingly clear that the poorest members of our society are not just being left behind, but are actively under attack. The same can be said for our legal system. It is the last line of defence not just for the disenfranchised, but for us all. It is the only way in which a government can ever truly be held to account and its policies challenged. This critical check and balance, at the core of our democracy, is being progressively undermined by austerity – but because it has not yet affected the middle classes, the public outcry has been limited.